Hanoi (VNA) – Turkish Prime Minister Binali Yildirim left Hanoi on August 24 afternoon, concluding his three-day official visit to Vietnam at the invitation of Prime Minister Nguyen Xuan Phuc. 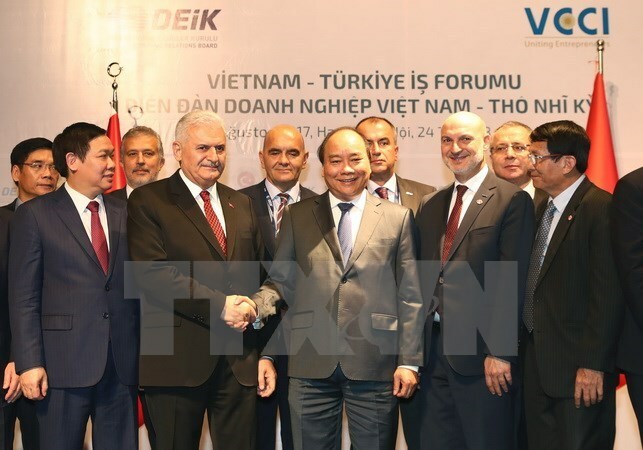 During his trip, PM Yildirim held talks with PM Phuc, met with National Assembly Chairwoman Nguyen Thi Kim Ngan, and attended the Vietnam-Turkey Business Forum. The Turkish PM also laid a wreath at the Heroic Martyrs Monument, paid homage to late President Ho Chi Minh at his mausoleum, and called at the Temple of Literature and the Ethnology Museum. At the meetings, the Vietnamese and Turkish leaders agreed to increase the exchange of delegations at all levels and encourage cooperation between ministries, sectors and localities of the two countries. PM Yildirim affirmed Turkey’s support for Vietnam’s efforts to maintain stability in the region in general and the East Sea in particular. He advocated the standpoints of Vietnam and other ASEAN member countries to settle disputes in the East Sea through peaceful measures and dialogues in line with international law. Vietnam and Turkey pledged to raise two-way trade to 4 billion USD by 2020 through trade and investment promotion activities. They agreed to strengthen coordination in transport, particularly in navigation, shipbuilding, crew member training, and encourage cooperation between their airlines such as Turkish Airline and Vietnam Airlines, in addition to cooperation in science-technology, culture-education, security-defence, and people-to-people exchanges. In 2018, the two countries will jointly organise activities to celebrate the 40th founding anniversary of their diplomatic ties. Vietnam proposed Turkey soon recognise its market economy and remove unreasonable taxes on Vietnamese exports such as footwear, fibre, conveyor belt, air conditioners, and mobile phones.